The above excerpt from Bob Marley‘s song, `Stand up, Get up’ could not have been more propitious any other time than now—in a world replete with human rights abuses, racism, poverty among others. No doubt, many reggae artists today draw their inspirations from the icon whose style of music continues to rub off on various genres of reggae—roots, rub-a-dub, ragamuffin, dancehall, lovers rock among others. Bob Marley was the first “third-world” global superstar and the artist responsible for bringing reggae to mainstream audiences. Marley’s unforgettable music alone would have earned him a place in music history, but his status as a moral and religious compass to countless admirers and followers set him above many other such celebrities. Robert Nesta Marley was born on Feb. 6, 1945 in Nine Mile, Saint Ann, Jamaica. His mother, Cedelia Booker, was an 18-year-old Jamaican girl and his father, the non-present Norval Sinclair Marley, was a much older white English sea captain. Bob and his mother moved to the tough Trenchtown area of Kingstown when he was ten years old. But Marley was much more than a Rastafarian Dylan writing catchy songs about the pressing issues of his times. During the late ‘70s, Jamaica was an island undergoing immense social and political upheaval. Bob used his considerable influence in an effort to promote peace and find a middle ground between rival political factions in his country. He was the victim of an assassination attempt for his troubles. He traveled the world, not only as a touring musician, but also as a goodwill ambassador for Jamaica and the Rastafarian religion. In 1978, he made his first trip to Ethiopia, the spiritual home of Rastafari, and stayed on a settlement donated by Emperor Haile Selassie I. Two years later, Bob Marley and the Wailers were invited to perform at the Zimbabwe Independence concert by the brand new nation’s brand new president. Bob’s song “Zimbabwe” had been an anthem for the soon-to-be-ex-colony of Rhodesia. Marley was a hero to countless Africans and was seen as an inspirational and unifying figure. 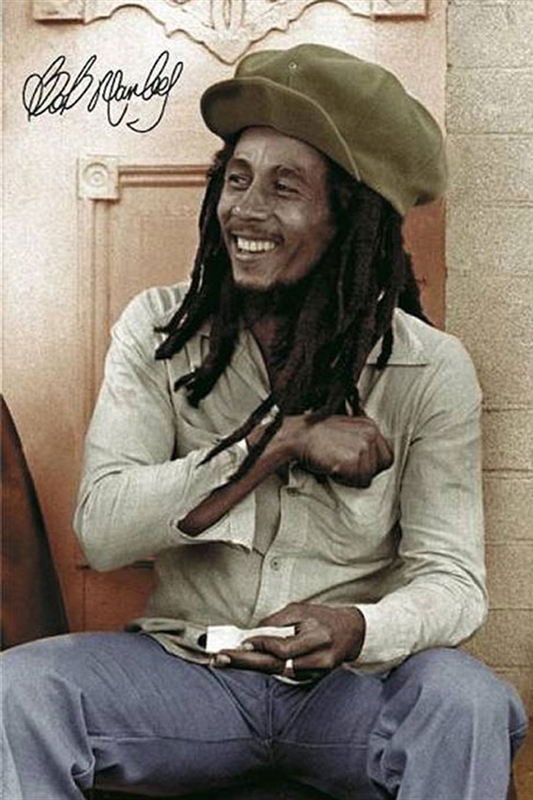 In 1977, Marley learned that he had a type of melanoma in one of his toes. His doctors recommended amputation, but Bob refused for religious reasons and instead simply had the toe nail and nail bed removed in hopes that would remove all the cancer. It didn’t. The disease metastasized throughout his body. In 1980, he agreed to seek a somewhat controversial treatment at the clinic of Dr. Josef Issels in Germany. “Issels Combination Therapy,” which has been labeled “ineffective” by the American Cancer Society, was indeed ineffective in Marley’s case. Bob wanted to die at home in Jamaica, but the trip back was too much for him. He passed away in a Miami hospital on May 11, 1981. Bob Marley’s death stopped Jamaica in its tracks. He was awarded the country’s Order of Merit, Jamaica’s third highest honor, for outstanding contribution to his country’s culture. The government provided him a state funeral ten days after his death as the Honorable Robert Nesta Marley O.M., with Prime Minister Edward Seaga and the Opposition Party Leader Michael Manley in attendance. The streets were lined with countless thousands of mourners who watched Bob’s funeral procession wind from Kingston to Marley’s mausoleum in his birthplace of Nine Mile. Bob Marley was laid to rest with a soccer ball, his Les Paul guitar, and a bud of marijuana.